Winnipeg (800,000 population) is the capital and the largest city in the province of Manitoba. The city of Winnipeg is multicultural and hosts numerous annual festivals, including the Festival du Voyageur, the Winnipeg Folk Festival, the Jazz Winnipeg Festival, the Winnipeg Fringe Theatre Festival, and Folklorama. Our sport teams are Winnipeg Blue Bombers (football), the Winnipeg Jets (hockey) and the Winnipeg Goldeyes (baseball). 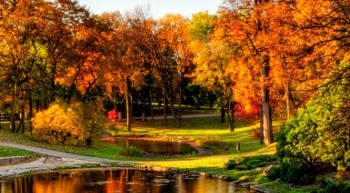 The weather in Winnipeg is seasonal and you can truly appreciate the four seasons from hot humid summers, 40 degrees Celsius (105F), to breezy autumn with colorful foliage ranging from greenish yellow to reddish orange. Winters in Winnipeg are harsh with temperatures dipping as low as -38 degrees Celsius (-38F). I love Winnipeg because it's a laid back city and people are friendly. Checkout the videos and pictures I took and see for yourself. Winnipeg is a beautiful city, Winnipeg is my city.